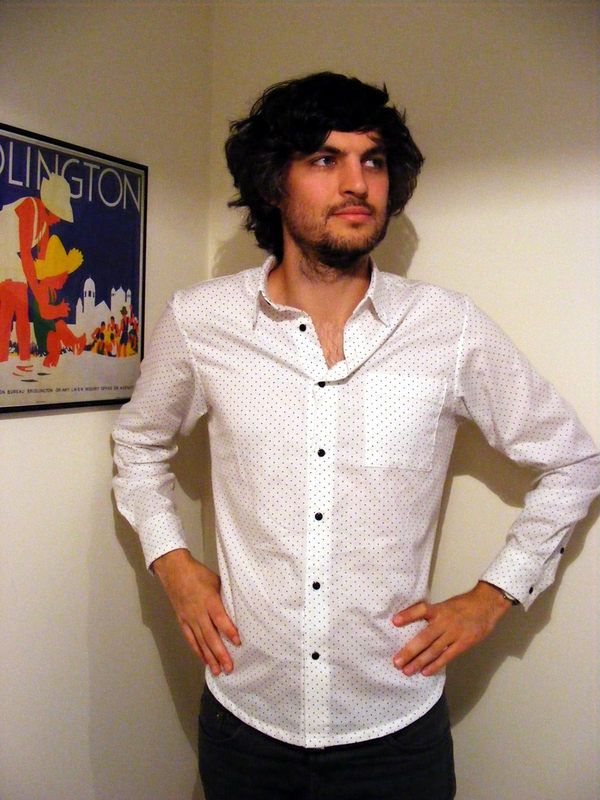 Another superb shirt made by Rachel and modelled here by Luke. 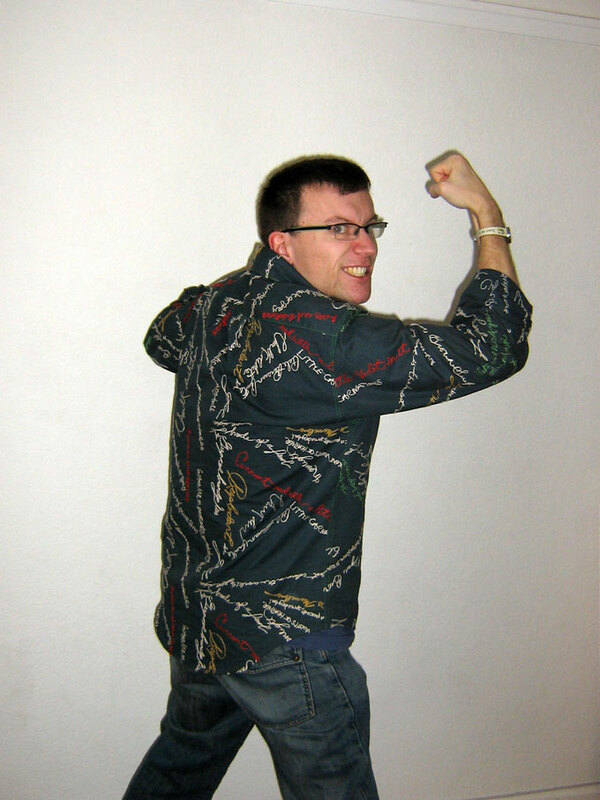 Again the fabric is a quilting weight cotton which is great for casual shirts. There is a light knit interfacing in the collar, cuffs and front placket. 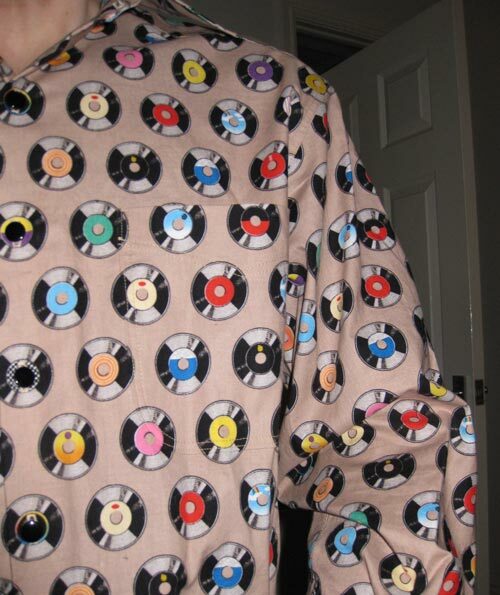 Rachel made this fabulous vinyl records print shirt for Luke, perfectly matching everything, of course. Shirtmaking is an art Rachel has mastered to a tee. The fabric is a quilting weight cotton which is on the heavy side for a shirt but great for casual (and fun!) projects. 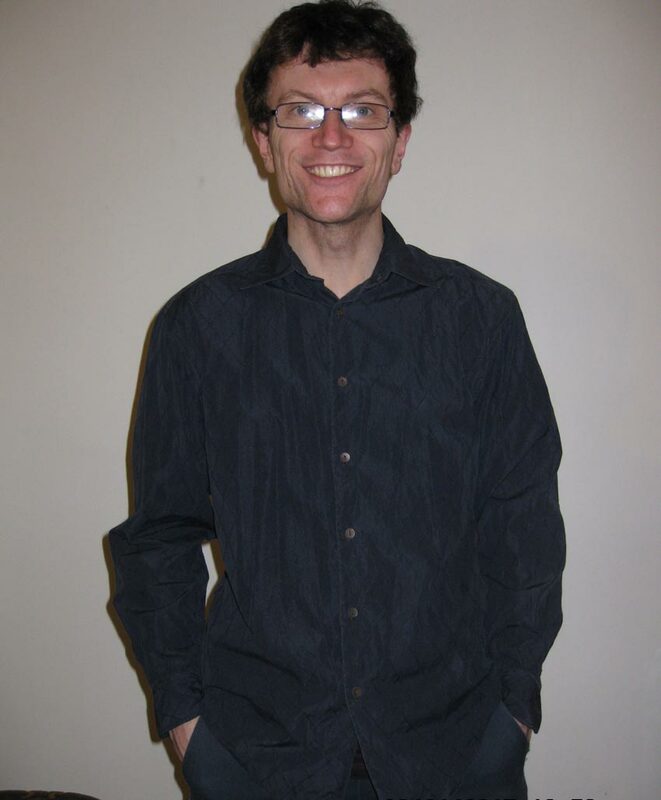 There is a light knit interfacing in the collar, cuffs and front placket. 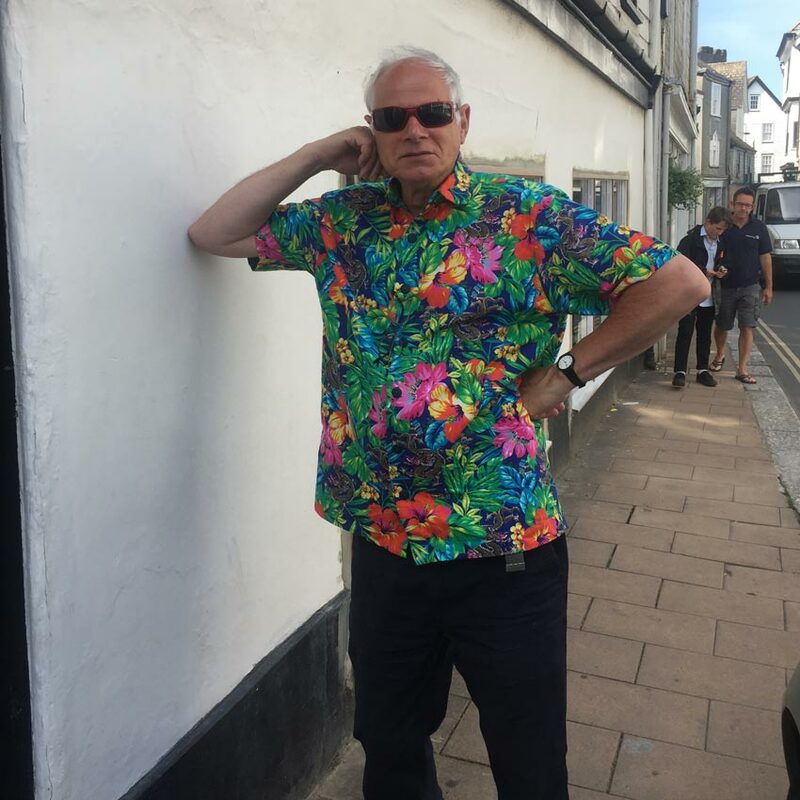 Here is Lesley’s latest shirt to be added to the collection. 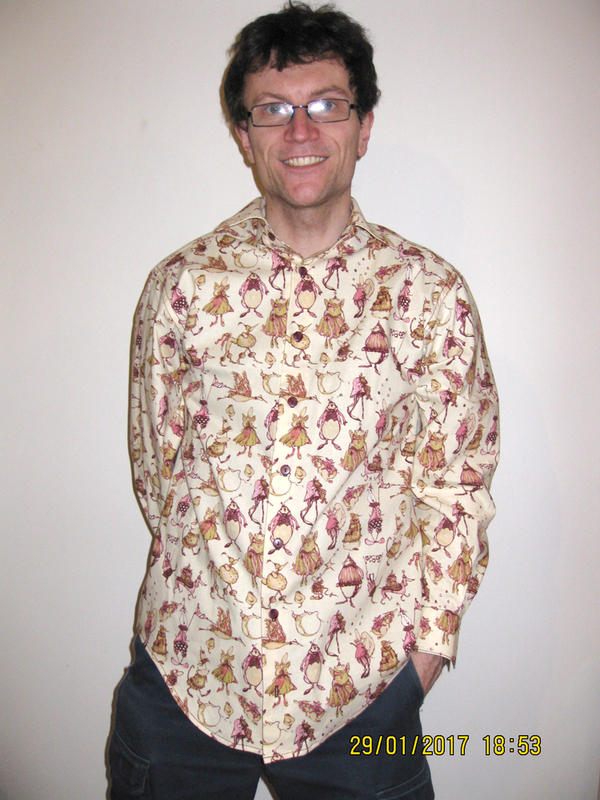 The wool challis drapes so well, it was a good choice for a warm winter shirt. She added detail on the pocket with a couple of Thermofax Screen prints and the buttons were sewn on with orange thread just to add a bit of warmth to the look of the garment. School shirts don’t have to be made out of polyester to be easy care, why are all the school shirts in the shops either horrid stiff cotton or polyester? Jane makes Kitcat and Miaow’s school shirts in supersoft cotton dobby lawn which hardly needs ironing at all, just flatten the collar and they are good to go! 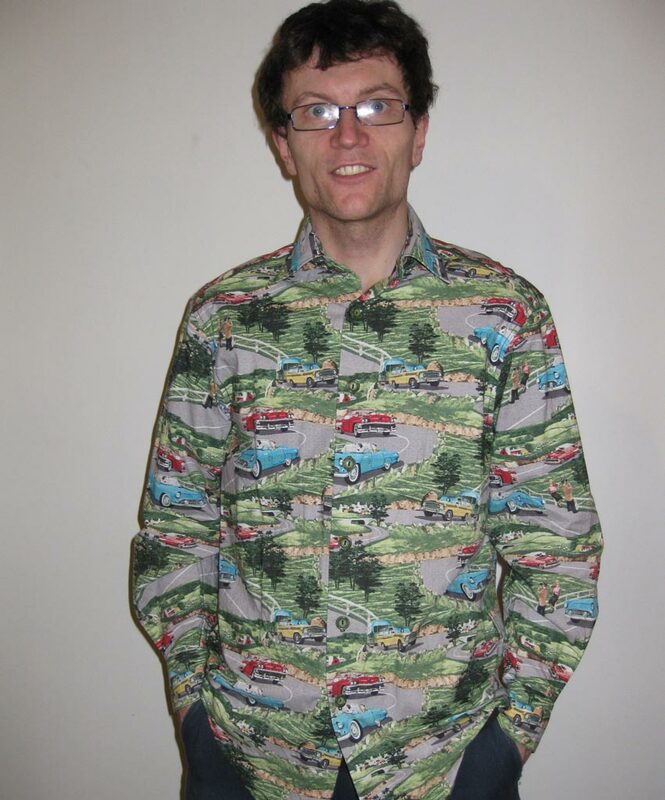 Made using Burda 9744 with such a tiny bit of fabric the under collar has been seamed in the middle. 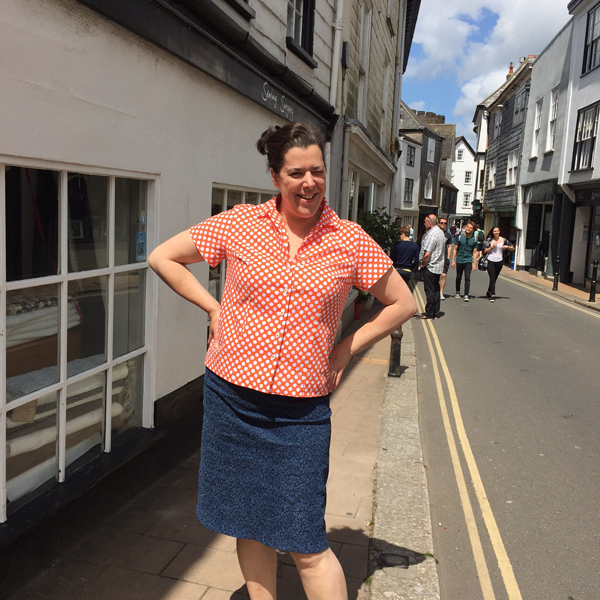 Jessie wearing her orange polka dot cotton short sleeve shirt made by Jane with daisy buttons and no interfacing. 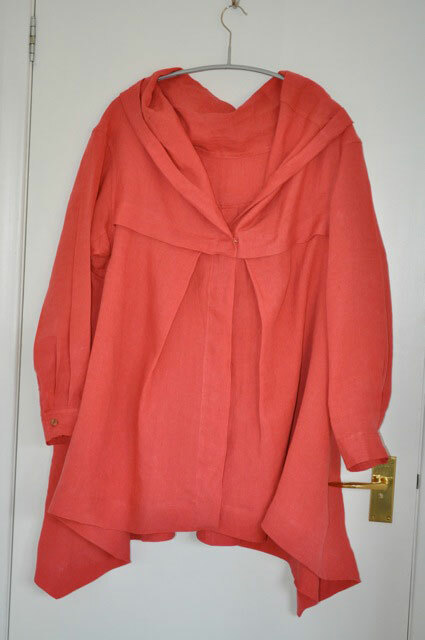 If the sun doesn’t shine in the glorious British summer just wear orange. 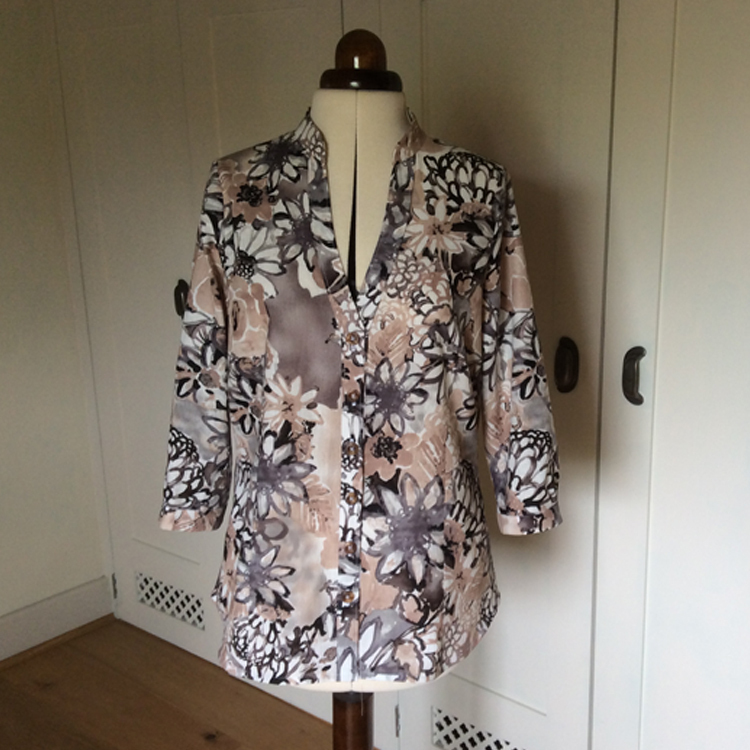 Shirley made this floral print linen and cotton shirt after a long hiatus in sewing (I’m wondering if this is Shirley’s sewing after a break how good was it before?!). Cut with a v-neck band and 3/4 sleeves, this shirt is a great Summer wardrobe staple. 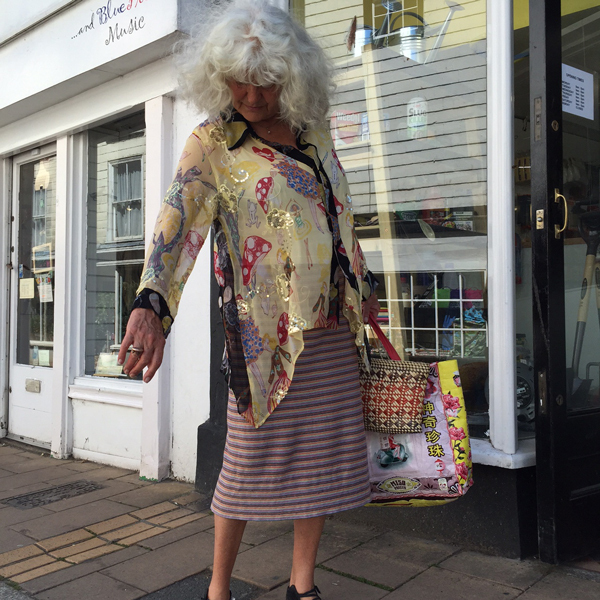 Marilyn off travelling to somewhere tropical and looking super cool in her floral stencil print linen and viscose shirt made with a Style Arc pattern “Elsie”. 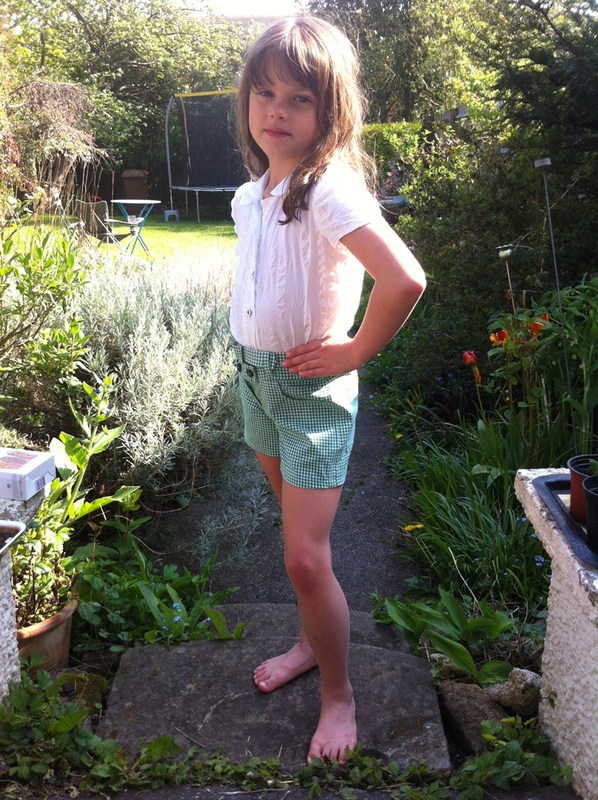 Summer ready and super stylish Kitcat in her white spotty jacquard cotton school shirt and green gingham shorts. 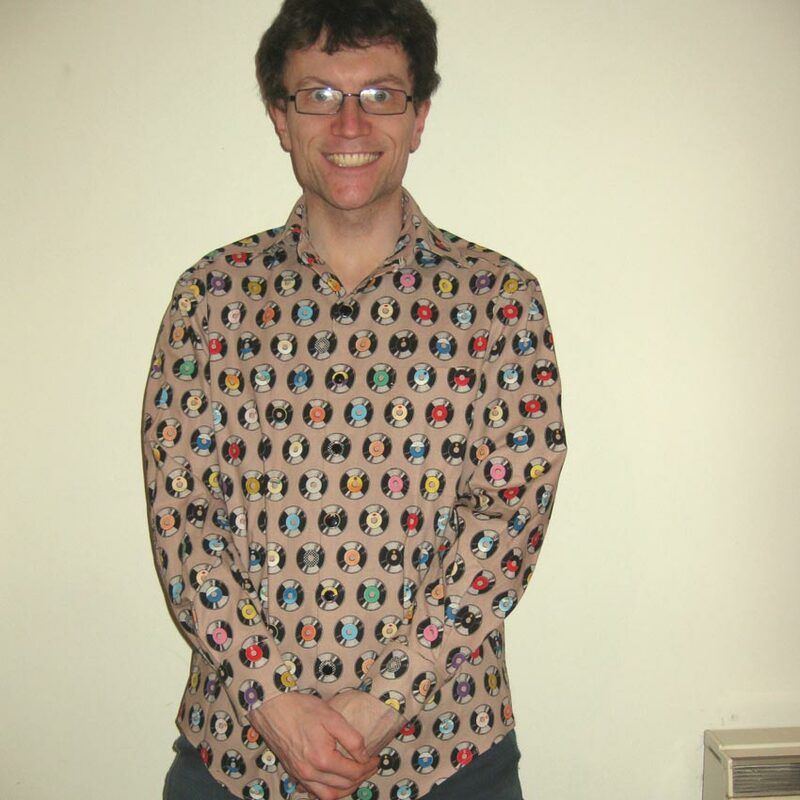 There is also a matching belt (covered by Harlequin). This girl will not be showing her knickers whilst handstanding in the playground! 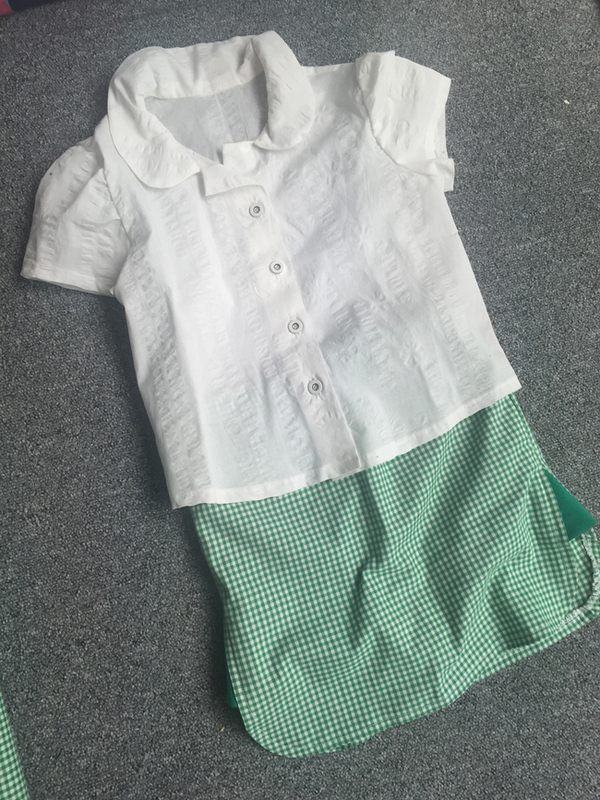 To make the gingham a little heavier for the shorts Jane backed it with cotton lawn interfacing (iron-on). Patterns: The shirt is Burda 9744 and the shorts are Burda 9481. School shirt made for Kitcat (by Jane) with white cotton seersucker using Burda 9744 pattern. 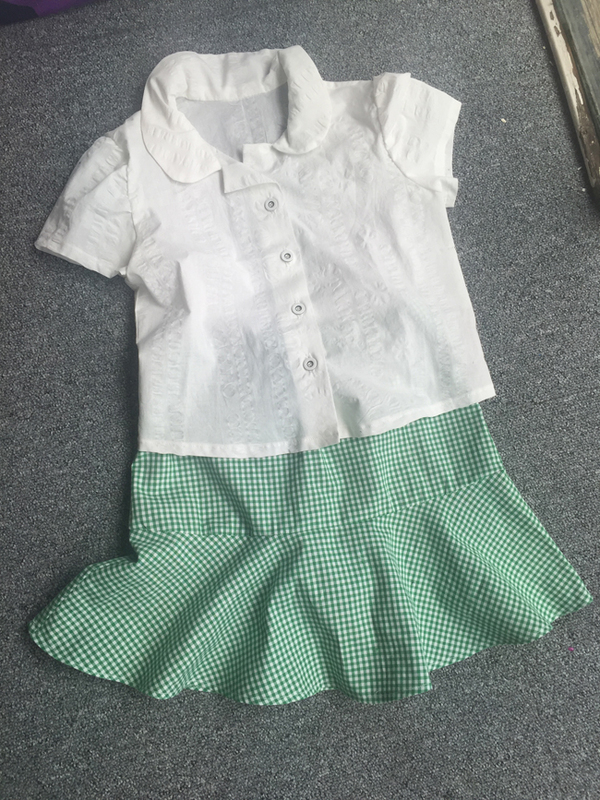 Green gingham cotton skater skirt using MCall’s 6918. 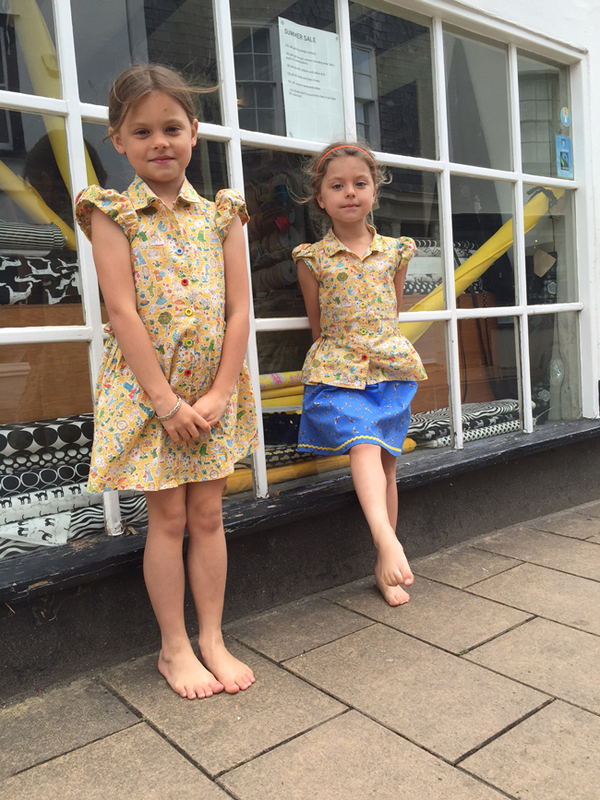 Kitcat and Miaow visiting Granny (Jane) at the shop wearing their matching Liberty tana lawn Alice in Wonderland print dress and shirt. The pattern is Burda 9417 (as seen already for school shirts), they tie in at the back. 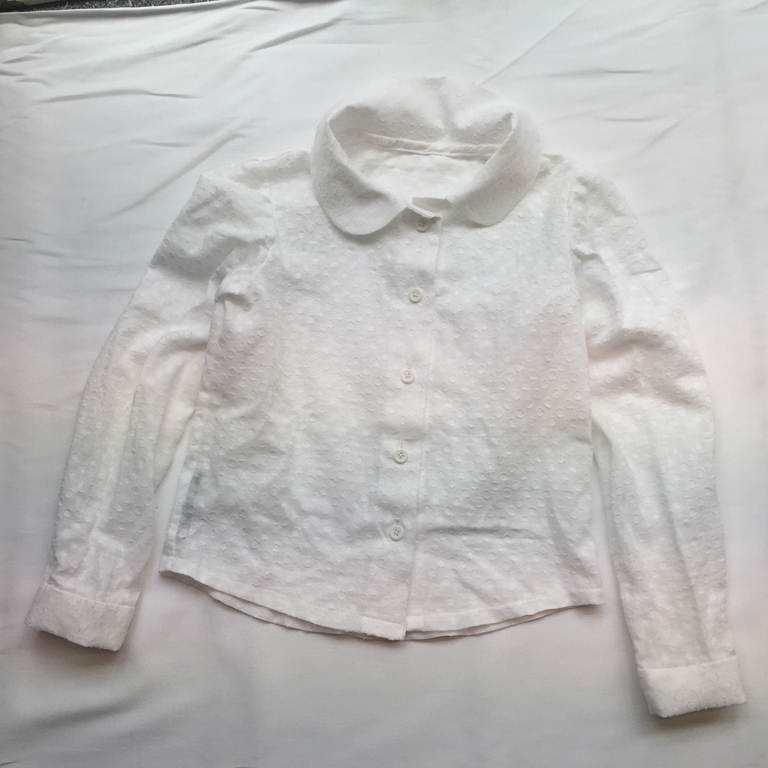 Jane didn’t use any interfacing for the collars, the sleeves puff with elastic in the hem. They both have mismatched coloured buttons. 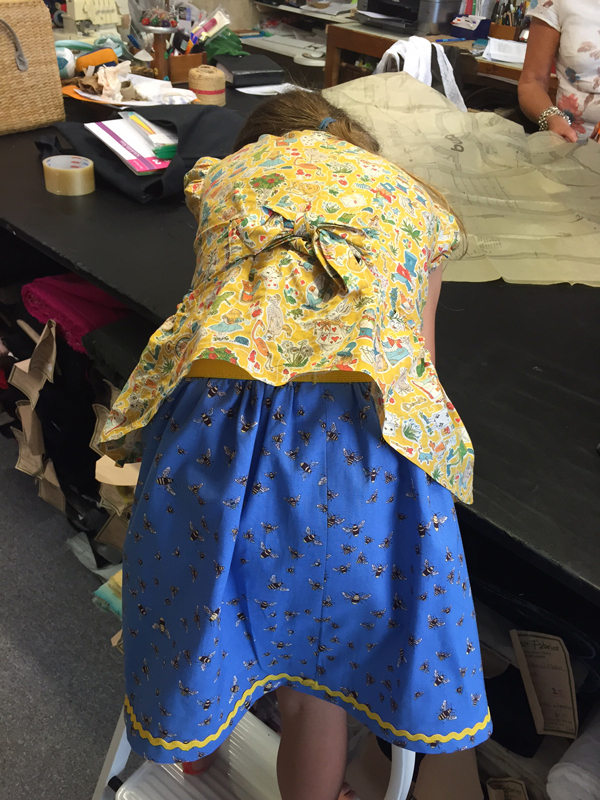 Miaow (age 5) is wearing a bee print cotton skirt trimmed with rick-rack and gathered onto yellow elastic which SHE MADE HERSELF! 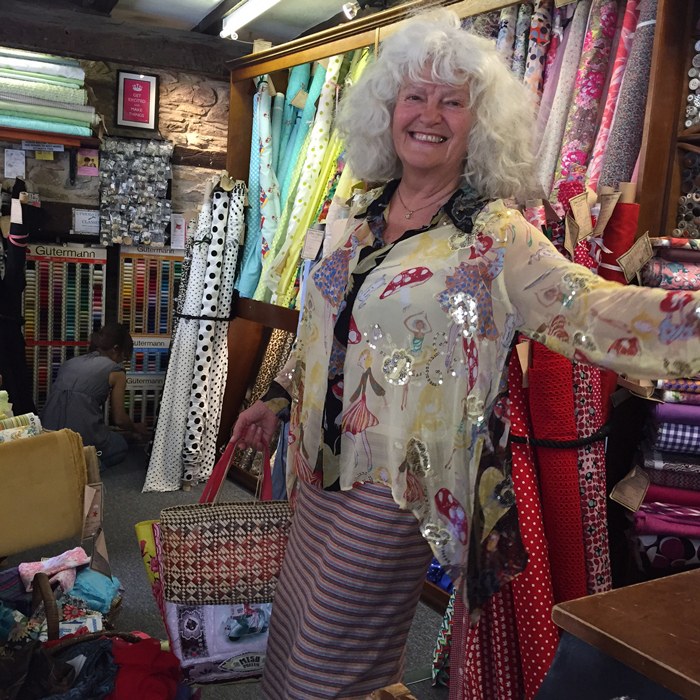 We helped a bit, she drove the sewing machine and overlocker with the pedals up on shoe boxes so she could reach. She sat on our lap and helped guide the fabric and shouted STOP! when she was going to drive off the edge. It’s probably the most fun you can have with a child without custard pies. Jane’s daughter Jessie wearing her LG polka dot printed cotton short sleeve shirt and her Rococo printed stretch indigo denim skirt. Jane wasn’t sure her 40+ year old daughter would want daisy buttons but she did. The skirt had to be taken in a bit because that denim is quite stretchy. 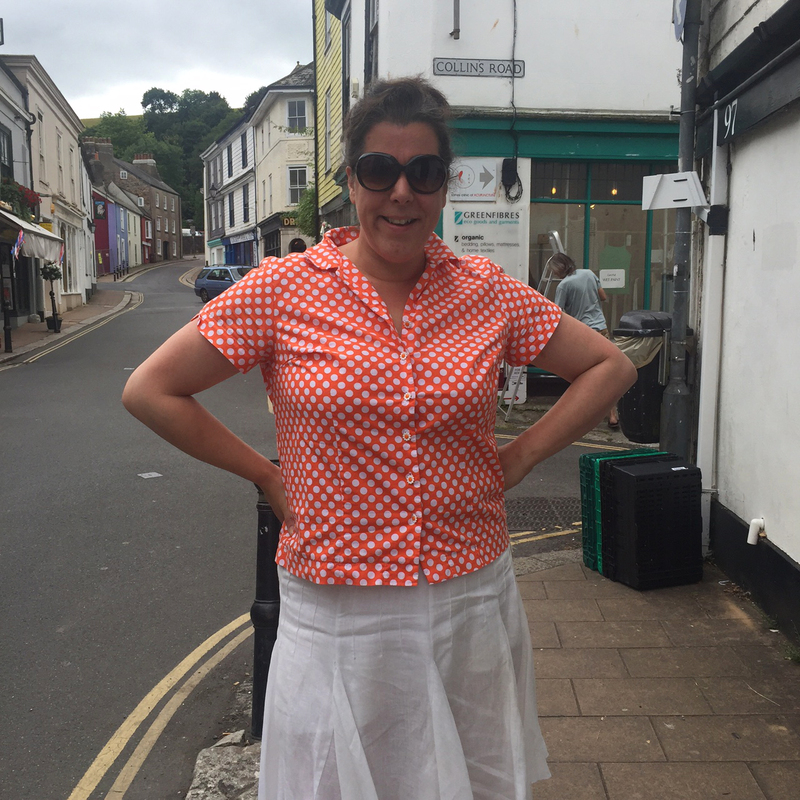 The pattern for the shirt is taken from an old M&S shirt and the skirt pattern is a long discontinued Burda pattern (3198), the closest available now is McCall’s 3341. 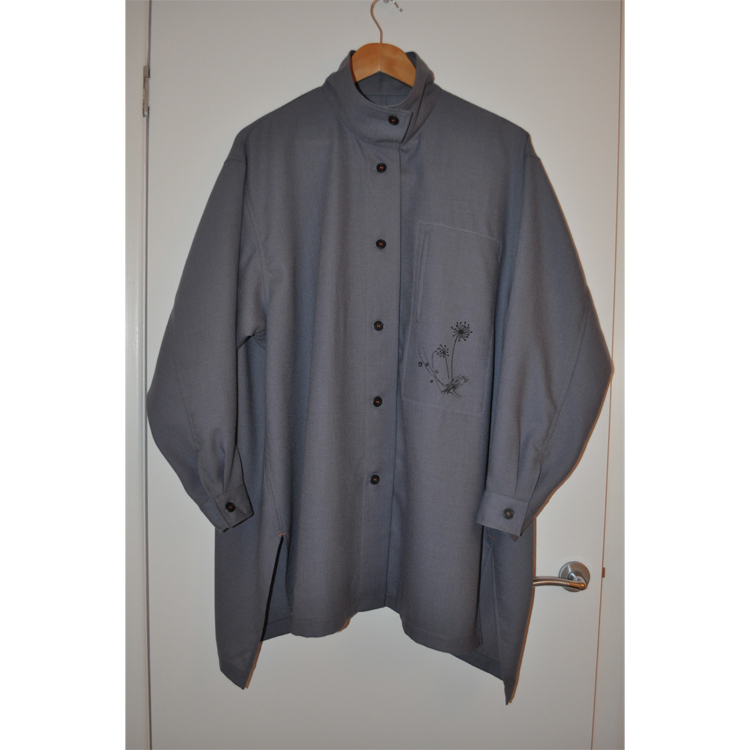 Jane’s shirt made up once again in an embroidered and hand painted Linen from Italy. 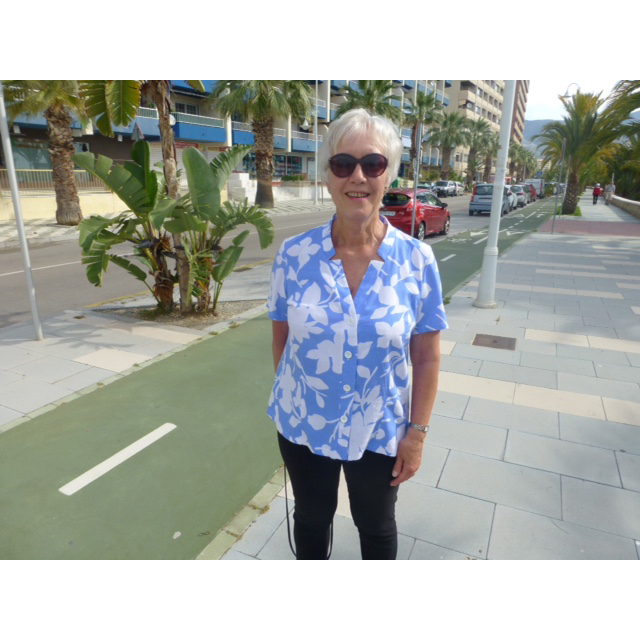 Jane was pleased with how economical this shirt was, getting all of it out of a metre (the facings were cut from the unpainted selvedges) -handy when the fabric is £85.00mt! 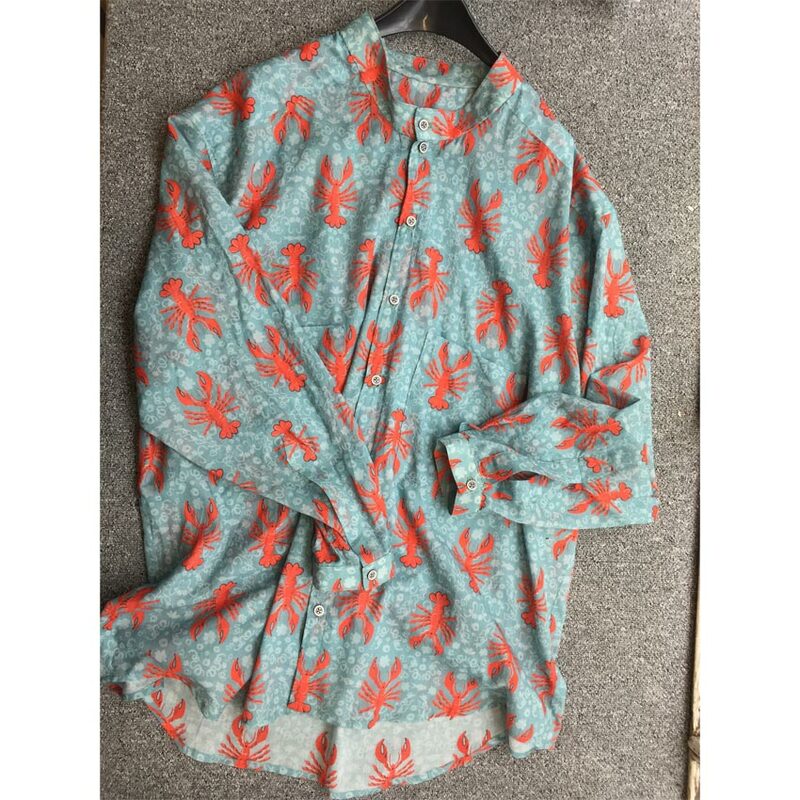 Amy made this fabulous spotty brushed cotton shirt using 4483. She goes into detail about the making of it on her blog Almond Rock. 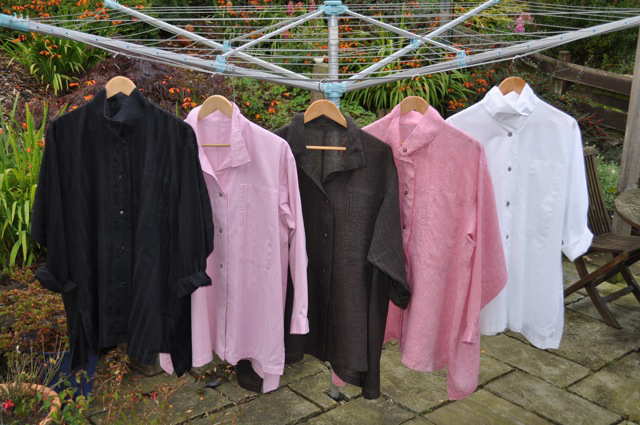 What’s the collective noun for linen shirts? For bullfinches it is a bellowing, I rather like that. A bellowing of linen shirts. These are all made by Lesley using a discontinued Vogue pattern No 1476. 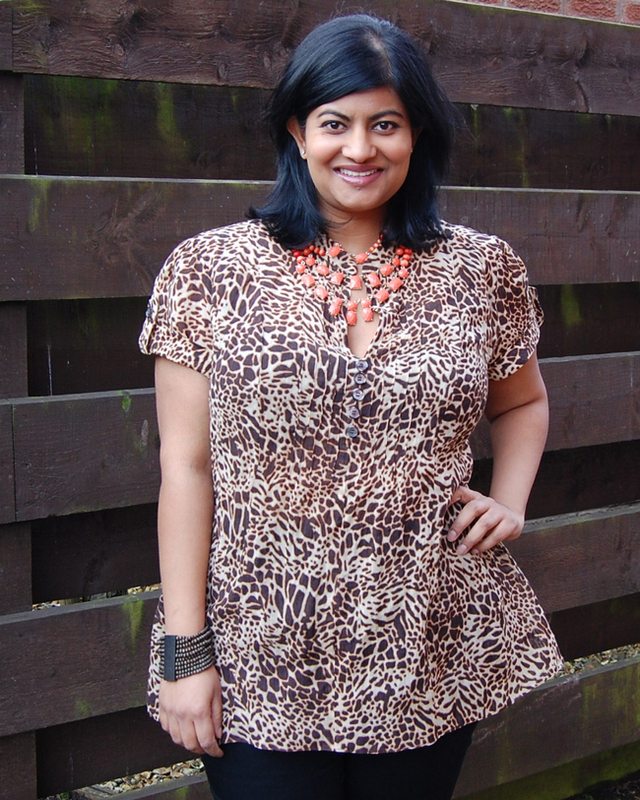 Manju wearing her beautifully made wool challis short sleeve pin-tucked animal print shirt. She has a blog, you can read all about it HERE. 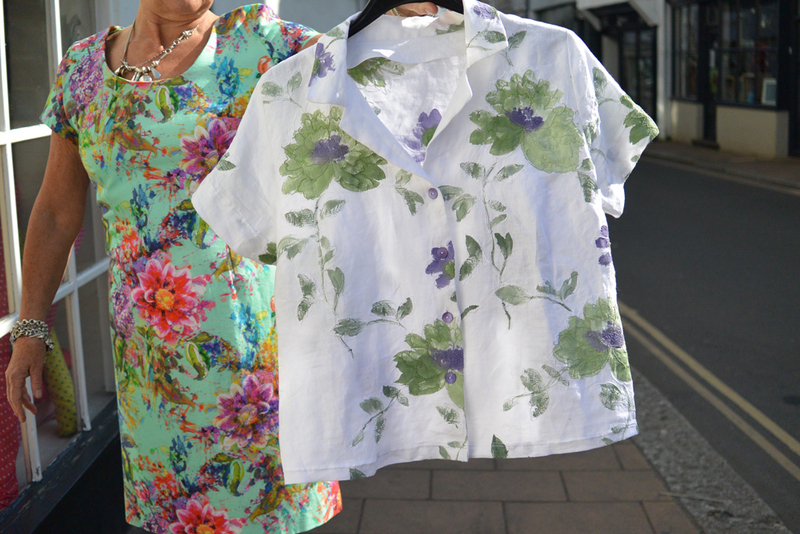 Bess used no interfacing in the construction of this shirt – looking at the one she copied it didn’t seem they had used any, she worried about the buttonholes cocking up not working and the collar-band not lying properly but it was fine, if the fabric was less stable than lawn she would use light interfacing. 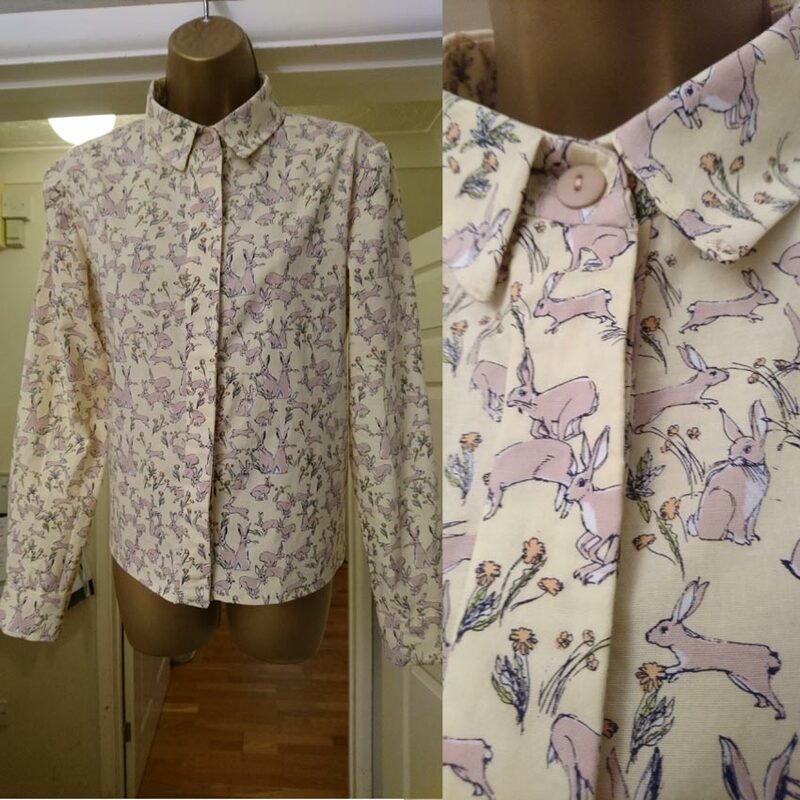 Pattern: drafted from manufactured shirt. 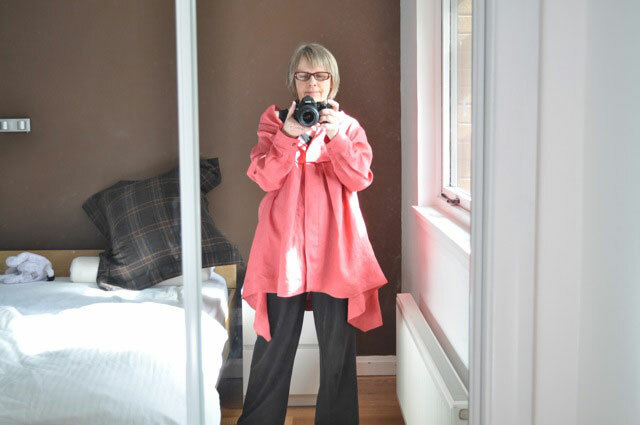 Lesley wearing her fabulous box pleated hooded linen shirt with placket. Luke wearing his embroidered cotton shirt made by Rachel (from classes).